We begin this installment of our ongoing series on our China trip in my favorite location. The Lingering Garden is a masterpiece of architecture and oriental style gardens complete with bonsai trees (However, it was devoid of bonsai kittens). 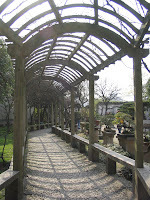 I'm not surprised that Chinese poets came to this garden to find inspiration in beautiful Suzhou. I could have easily spent a few more hours walking around the pond and I can't believe that the entire complex of gardens and buildings once belonged to one family. 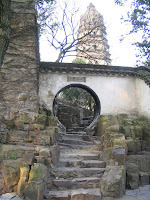 The third picture in this post is from the leaning Huqiu Tower in Suzhou. The brick work on the structure was amazing and it is older than the Leaning Tower of Pisa. Vanessa took this one from a plaza to the side of the tower. 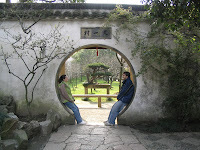 Next time, I'll write about the very end of our trip in Hangzhou and Shanghai.